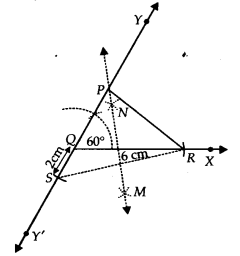 NCERT Solutions for Class 9 Maths Chapter 11 Constructions Ex 11.1 are part of NCERT Solutions for Class 9 Maths. 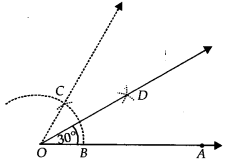 Here we have given NCERT Solutions for Class 9 Maths Chapter 11 Constructions Ex 11.1.
, the bisector of ∠COD. ∵ O is the centre of the semicircle and it is divided into 3 equal parts. 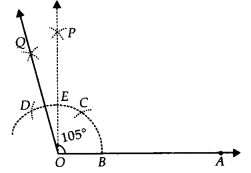 , the angle bisector of ∠BOC. , the ajngle bisector of ∠FOC. is the bisector of ∠BOC. is the bisector of ∠COF. Step III : With centre at B and keeping the same radius as above, draw an arc to cut the previous arc at C.
which gives ∠BOC = 60°. Step II : Construct ∠AOB = 60°. Step III : With centre B and keeping the same radius, mark a point C on the previous arc. Step IV : With centre C and having the same radius, mark another point D on the arc of step II. , which gives ∠COD = 60° = ∠BOC. Step IV : With centre C and having the same radius, mark another point D on the arc drawn in step II. 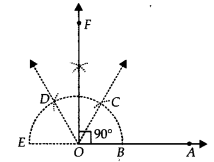 Step V : Draw OP, the bisector of CD which cuts CD at E such that ∠BOP = 90°. 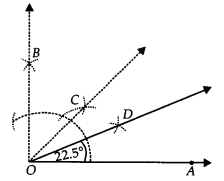 pt us construct an equilateral triangle, each of whose side = 3 cm(say). Step III : Taking B as centre and radius equal to OB, draw an arc to intersect the previous arc at C.
Step IV : Join OC and BC. Thus, ∆OBC is the required equilateral triangle. are drawn with the same radius. ∴ OBC is an equilateral triangle. 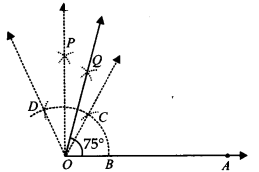 Construct a ∆ ABC in which BC = 7 cm, ∠B = 75° and AB + AC = 13 cm. , cut off a line segment BC = 7 cm. Step V : Join DC. Step VI : Draw a perpendicular bisector of CD which meets BD at A. Thus, ∆ABC is the required triangle. 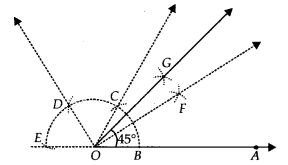 Construct a ABC in which BC = 8 cm, ∠B = 45° and AB – AC = 35 cm. , cut off a line segment BC = 8 cm. Construct a ∆ ABC in which QR = 6 cm, ∠Q = 60° and PR – PQ = 2 cm. , cut off a line segment QR = 6 cm. Step III : Construct a line YQY’ such that ∠RQY = 60°. Step IV : Cut off QS = 2 cm (= PR – PQ) on QY’. Step V : Join SR. 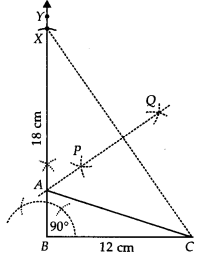 Step VI : Draw MN, perpendicular bisector of SR, which intersects QY at P.
Thus, ∆PQR is the required triangle. Construct a ∆ XYZ in which ∠Y = 30°, ∠Y = 90° and XY + YZ + ZX = 11 cm. Step IV : Draw AR, the bisector of ∠BAP. Step V : Draw BS, the bisector of ∠ABQ. Let AR and BS intersect at X.
, which intersects AB at Y.
, which intersects AB at Z. Step VIII: Join XY and XZ. Thus, ∆XYZ is the required triangle. 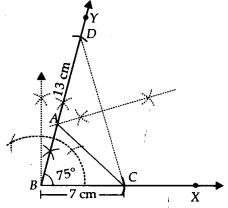 Construct a right triangle whose base is 12 cm and sum of its hypotenuse and other side is 18 cm. Step I : Draw BC = 12 cm. Step II : At B, construct ∠CBY = 90°. , cut off a line segment BX = 18 cm. Step IV : Join CX. Step V : Draw PQ, perpendicular bisector of CX, which meets BX at A. Step VI : Join AC. 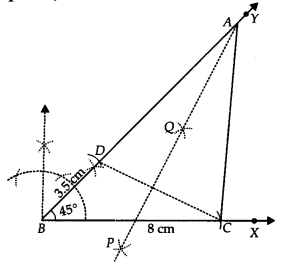 We hope the NCERT Solutions for Class 9 Maths Chapter 11 Constructions Ex 11.1 help you. If you have any query regarding NCERT Solutions for Class 9 Maths Chapter 11 Constructions Ex 11.1, drop a comment below and we will get back to you at the earliest.